Learn more about how to export HTML from your Listrak Composer built emails. If you're looking to preview your Composer message in a browser outside of the Listrak Platform, or to convert your Composer message to HTML for increased flexibility - you can now easily export the HTML from an email built with Listrak Composer. After you've built an email with Listrak Composer, click Apply Design and Save your message. 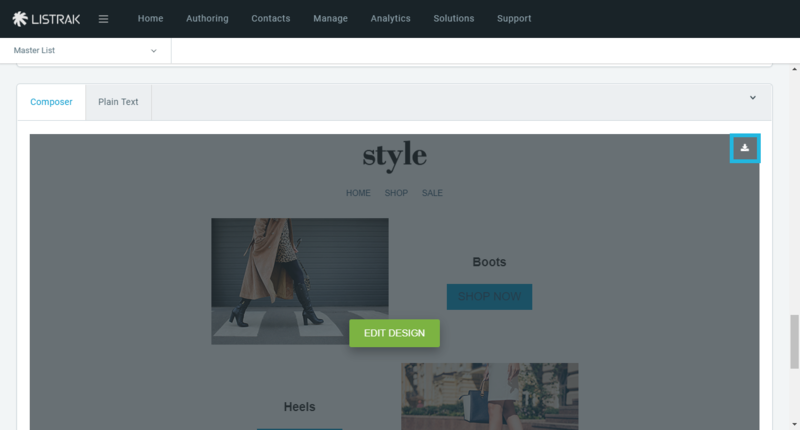 Navigate down the Message Authoring page to the email builder. Navigate to the upper right-hand corner of the message. NOTE: HTML is downloaded as a webpage. Be sure to right click and open with a HTML editor of your choice. Listrak's system links, dynamic content, and personalization fields are automatically removed from exported HTML. These are all specific to Listrak (ex: #Listrak\Email#) and will not work if being used in a third party platform. Be sure to update these if when using this content again. Saved Content is rendered as static HTML when exported. Accidentally create a message on the wrong list? Contact the Listrak Client Success Team to have this message moved for you, retaining drag and drop functionality, instead of manually exporting the HTML. Want to download the HTML for a template built with Composer? Apply the template on the message authoring page and then follow the above steps to export the HTML. You can now easily add third party HTML directly into a Composer email using the HTML element.